Juvenile kitties require an excellent balance of proteins and fats to help build and develop their tissues and organs as well as hasten the development of their brain, spinal cord, and nerves. These structures are crucial as these play a role in the development of their reflexes, something that all cats are expected if they want to survive. More importantly, kittens need high calorie food from animal protein-rich, not carbohydrate, sources. Good nutrition starts from kittenhood just as optimum nutrition starts from babyhood in humans. It is for this reason that we embarked on a quest to find out the 10 best kitten foods for your cat so you’ll be more empowered to look after their optimum growth and development. After all, you are their parent now. 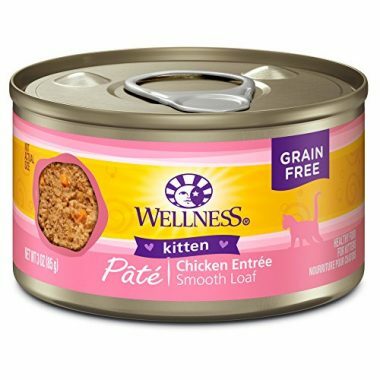 You will love the Wellness Natural’s Complete Health Kitten Formula’s excellent combination of chicken meat, liver, and broth blended into one appetizing pate that your juvenile feline will love. Considered as the best cat food for kittens, the Kitten Formula of Wellness Complete provides exceptional levels of moisture plus the right amounts of proteins and fats. Its low-magnesium preparation should help ensure your kitties’ optimum immune and urinary system functioning while the additional taurine can help provide for better eyesight as well as cardiovascular apparatus. It comes in grain free formulation so you don’t have to worry about upsetting your feline’s tummy. The Wellness Natural Complete Health Kitten Formula is the perfect kitten wet food for supporting its rapid growth and development. Containing an amazing blend of top-rate animal proteins like chicken, salmon, eggs, and beef liver, the Nature’s Variety Instinct kitten wet food is predicated on the belief that young felines need a diet that is as close to their original ancestral diet as possible. It is for this reason that Nature’s Variety deemed it important to prepare a certain type of kitty food that will closely resemble what felines feed in the wild. That is why there’s an excellent combination of poultry, meat, and fish to give your juvenile cat one of the best sources of essential amino acid-complete proteins. This is important for its optimum development and growth. The essential fatty acids are near-perfect ratio, ensuring optimum anti-inflammatory and antioxidant properties as well as optimum nervous system functioning. The delicious loaf texture of the Nature’s Variety is sure to improve the appetite of your young feline. Your young feline will love this kitten formula that features an exceptional blend of the best tasting protein rich ingredients you could possibly imagine. 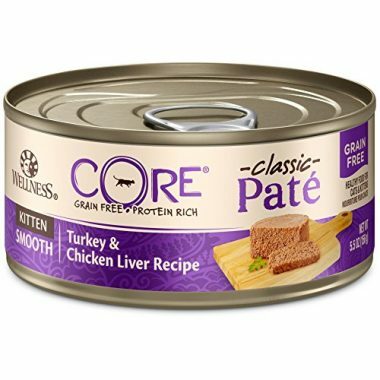 The Wellness CORE Natural Grain Free Canned Kitten Food in an amazingly rich turkey and chicken liver pate preparation provides kittens with a protein-focused diet that is sourced from a combination of poultry and fish. More than two-thirds of its proteins are sourced from premium quality ingredients. The fish ingredient is what supplies the Wellness CORE its brain-boosting DHA. Other essential micronutrients have been added in the formulation of this kitten wet food and are sourced from a variety of food items including healthy botanicals like yucca and rosemary. All of these ingredients combine to help make sure that your little Garfield grows to become one of the healthiest cats in the hood. Adding brown rice, carrots, and sweet potatoes into a primary blend that is made of chicken meat, liver, and broth plus fish and egg may not sound appetizing to you. However, give your kitty the Blue Buffalo Healthy Gourmet Kitten Wet Cat Food and you’ll understand just how palatable this preparation really is. Only wholesome natural ingredients were used in this Blue Buffalo preparation. Flaked chicken are slow-cooked in special gravy that is so savory you’re actually giving your young felines a real gourmet treat. The chicken pieces are tender and succulent, treating your feline to a diet like no other. Blue Buffalo strongly believes in providing cat nutrition that is as close to the original wild diet as possible. That is why it provided an excellent mix of real ingredients bathed in a sumptuous sauce. Every variant of Purina’s Fancy Feast preparation is made only of the highest quality proteins one can expect from a leading manufacturer of doggie and kitten formula. Take for example their Tender Ocean Whitefish Feast. 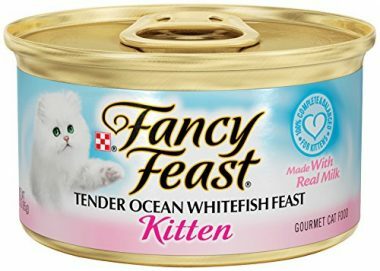 This kitty food boasts or ocean whitefish, tuna, fish broth, fish liver, and meat byproducts to give your kitty cat one of the best protein rich cat food in the world. 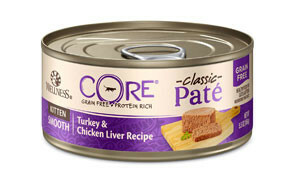 The ingredients are finely ground and then finished into one smooth mixture to provide your cat a pate-like consistency. 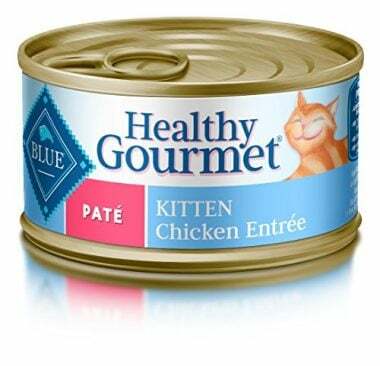 It may not be as saucy as the Healthy Gourmet Kitten, but it sure is super palatable, young cats have been known to devoir an entire can in a single sitting. The formulation is designed to meet the exacting nutritional demands of today’s feline pets so they grow to become healthier. 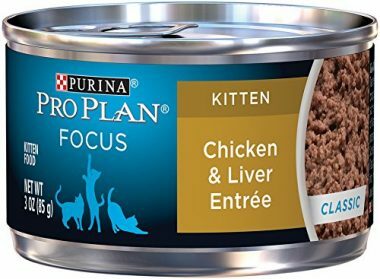 The Chicken and Liver Entrée of Purina’s Pro Plan Focus Kitten Classic Canned Cat Food is just one of many variants of the company’s Focus line. 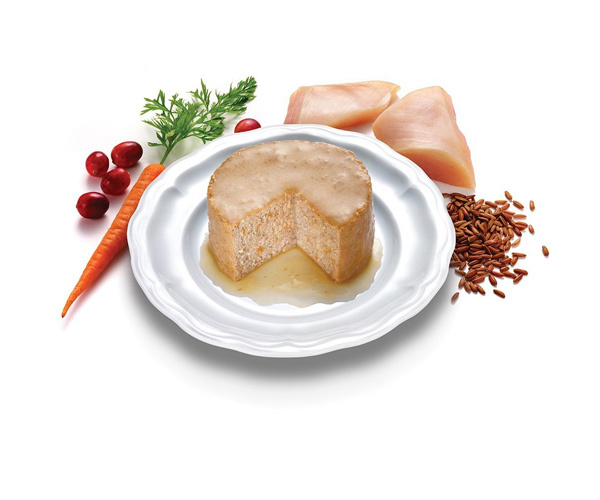 It’s filled with great-tasting chicken, fish, and liver, providing your youthful tabby with a variety of exceptional protein sources while ensuring the optimum absorption of essential nutrients as well as essential amino acids. This kitten wet food is especially designed to cater to the high protein requirements of very young pussycats so that they will have a much brighter future ahead of them. Quite literally, their future outlook definitely looks bright with the addition of taurine in their blend. Plus, the enrichment of the kitty food with phosphorus and calcium simply means your kitty is going to grow up like a pouncing tiger in no time. 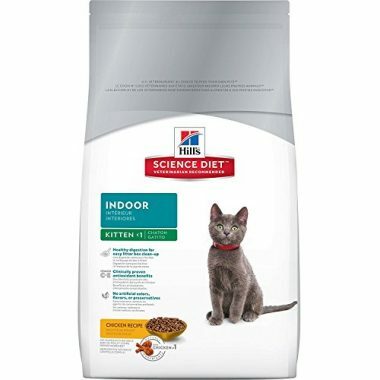 You don’t have to look any further if you’re looking for the best kitten food as the young kitty formulation of Hill’s Science Diet, the Indoor Kitten Dry Cat Food, is a surprisingly popular juvenile kitty food trusted by many pet owners. 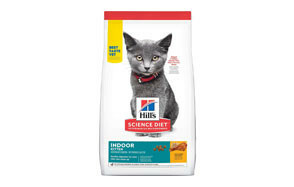 Following the same clinical recipe that has made Hill’s Science a trusted name in pet nutrition, the Indoor Kitten is specifically formulated to provide young cats with the most balanced nutrition necessary for their indoor lifestyle. It’s formulated with DHA for nervous system development and Vitamins C and E for immune system support. The protein content, while lesser than competitors, are easily digestible, allowing these to be used immediately by the young feline. 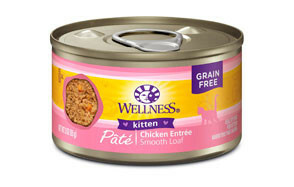 There are no artificial ingredients, too, making this nutritious and delicious meal truly safe for all growing kittens. Protein-rich is what the CORE series of kitten dry food of Wellness Natural wants it to be known for. 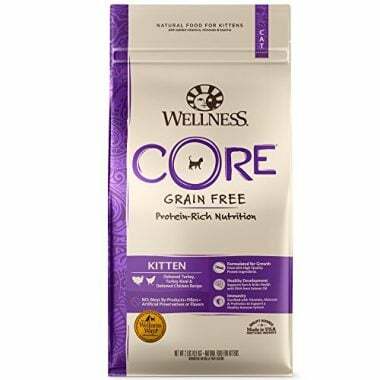 And with a protein content of at least 45%, we can honestly say that Wellness CORE Natural Grain Free Kitten Formula Dry Cat Food is right on the money. This is very important since kittens require exceptionally greater amounts of proteins than adult cats do. This is needed for tissue building and the formation of a variety of substances in the feline body. The Wellness CORE best cat food for younger kitties is also calorie-dense, giving your kitty the much-needed energy it needs to run and play. What’s even amazing is that these calories are primarily derived from proteins and fats and just a few ones from carbs. This formulation also comes with 90 million CFUs of various Lactobacilli and Enterococci species, making the kitty gut a lot healthier. 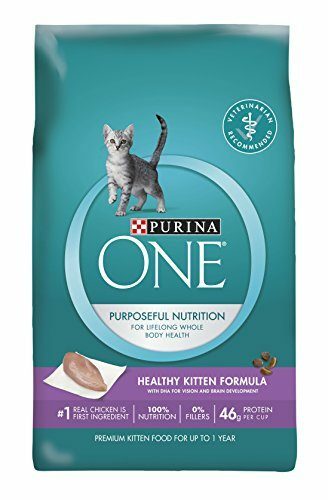 The most energy-dense kitten dry food in this list, Purina ONE Healthy Kitten Formula Premium Dry Cat Food features a great blend of proteins and fats as well as micronutrients that are crucial to the optimum growth and development of young kitty cats. It comes in a rather crunchy texture which doubles as a dental chew, fully capable of cleaning your feline’s teeth and preventing the buildup of plaque and tartar. Every cup of the Healthy Kitten Formula is equivalent to 46 grams of lean protein which is primarily composed of real chicken. It does come with chicken byproduct meal but this should not really be a concern since Purina can be relied upon to utilize only the safest internal organs of chicken to include in the byproduct meal. It also comes with fish meal to provide your juvenile cat with the right levels of EPA and DHA for smoother, finer fur. It does come with cereal grains, however. Nevertheless, it provides exceptionally well-balanced nutrition for your kitten. 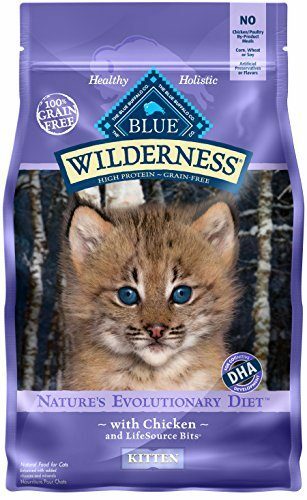 Deboned chicken is what constitutes the principal ingredient of the BLUE Wilderness Kitten High Protein Grain Free Dry Cat Food. This kitten dry food is rich in proteins that are sourced from a variety of premium quality sources like chicken, turkey, and fish. Flaxseed is also included to provide your cat with ALA while the fish oil is what provides kitties with DHA and EPA. The Blue Wilderness also comes with healthy grains as well as beneficial botanicals like turmeric and rosemary. Also included are nutritious fruits like blueberries, apples, blackberries, cranberries, and pomegranates. The Wilderness Kitten also feature 5 strains of various beneficial bacteria that help in promoting optimum digestive health so that all of the nutrients present in your kitty formula will be absorbed and utilized by individual cells and tissues. If you’ve been wondering what kind of food to buy for the kitten in your home, then you’ve come to the right place. In this section, we’ll be looking at the things you have to keep in mind when buying kitten food. We’ll also attempt to explore your options when it comes to choosing between wet and dry kitten food. And since this is all about your kitten’s nutrition, we might as well take a look at the kinds of food that you should never give to your juvenile feline friend. What to Consider When Buying Kitten Food? Young cats require an entirely different kind of nutrition compared to other cats across the feline lifespan. This is because of their rapid growth and development that kittens require a special kind of diet that is designed for them. It is thus, important to keep this in mind whenever you’re shopping for the best food to buy for your kitten. At any rate, the following can be helpful considerations in your decision making. When we think about cats we think about creatures that can spend the rest of the day lazing around, sleeping in their favorite nook, or doing what they do best which is technically nothing. Now take a look at your kitten and you’ll see a little bundle of joy whose energy is limitless and who will only stop to feed or sleep. In hindsight, even human kids especially toddlers and preschoolers have tremendous amounts of energy that they are dubbed as little explorers. The same is true with kittens. That being said, one of the primary considerations when it comes to choosing the right kitten food is the calorie content. As a general rule you need a kitty formula that is high in calories. However, it is more important that majority of the calories be sourced from proteins and fats, not from carbohydrates. We’ll have more of this later. Why do kittens need more calories? Well, half of the calories they will consume will be needed to fuel the various processes in the body leading to the formation and continuing development of tissues and organs. The development of tissues involves a lot of chemical processes which, in turn, require tremendous energy in the form of calories. Allocating 50 percent of your kitten’s calories for this purpose alone means it only has 50 percent left for all other activities. When it comes to ‘other activities’ we mean their inherent need to play, exercise, and be free. They roam around, play with prey toys, and many others. As you may have already observed, kittens are more active than older cats. As such, they will require the remaining 50 percent of calories to fuel their physical activities. Let us try to quantify this a bit. Say you are only going to give 300 kilocalories to your kitten, 150 kilocalories of which will be spent on building tissues and organs. Do you honestly think that the other 150 kilocalories will be sufficient to supply its energy needs for physical activities? We did mention above that kittens need a high calorie diet, but one that is supplied by both proteins and fats and not from carbs. The reason for this is quite simple. Cats are generally known to be obligate carnivores. Their digestive systems are better equipped to process proteins and fats rather than carbohydrates. While some will argue that there is no proof that wild felines don’t eat fruits, vegetables, and root crops, there is also no proof saying that they do. However, experimental research show that when given three different types of diets – one each rich in proteins, fats, and carbohydrates – cats have a strong preference for proteins. If they are given carbohydrate-rich foods, clinical studies reveal that the appetite of cats is significantly reduced. Compare this with an all-protein diet and they can easily finish the meal. Protein is essential for tissue building. That is why it is imperative that the high calorie requirement of kitten food be made mostly of proteins. These macronutrients provide the backbone upon which tissues and organs are formed and continuously developed. It is also through these substances that other chemicals such as hormones and enzymes are synthesized to further aid in a host of feline physiologic processes. Now we understand why protein is important in cats, especially among kittens. What is more crucial to understand now is the type of protein that is contained in these kitten formulations. Proteins can be sourced from animals and plants. As a general rule, plant-based proteins should be avoided since they do not contain all the necessary amino acids crucial for feline physiologic functioning. Don’t get us wrong but certain plants do contain amino acids. The only problem is that they contain some and are deficient in others. So, if you have to give a plant-based protein, you will still have to supply the missing amino acid through other means such as supplementation or even the giving of an animal-based protein. Now, if you do provide animal proteins in addition to plant proteins, then you can technically forget the plant proteins altogether since you’re already giving your young cat all the essential amino acids that it needs. That being said, it is important to choose a healthy kitten food that is rich in animal based proteins. This should be relatively easy since you only need to read the label carefully. Your best bet is to look at the first 5 ingredients of the product. The very first ingredient should be a clearly identifiable animal protein. For example, it should state “turkey” or even “salmon” and not merely “poultry” and “fish”. The reason for this is quite simple. Getting the manufacturer to clearly identify the principal ingredient as being ‘turkey’ or ‘fish’, for example, means that it is able to source its proteins only from the meat of these animals. If you read “poultry” or “fish”, the next logical question to ask will be “what kind of poultry” or “what kind of fish” does the product contain? So, steer clear of vague ingredient descriptions. Likewise, if you read “meal”, then it should be able to clearly identify what kind of “meal” it contains. Compare “chicken meal” to “poultry meal”. Which do you think is clearer? Obviously, ‘chicken meal’ gives you a better idea of the contents of the product. If it’s ‘poultry meal’, the question of what kind of poultry is put into the formulation of the kitty food again crops up. Regardless of what experts say about the high protein requirements of cats, especially kittens, pet food manufacturers simply cannot afford to go all-protein as it will jack up the price of their products significantly. If you go to the grocery and buy a pound of lean beef, you know that you’ll be paying about $4 to $6 depending on the cut. A pound of fruits, on the other hand, typically costs you around $0.50 to $2, again depending on the variety. The same is true with vegetables. Technically, it is more expensive to go all-protein. Pet food manufacturers know this. They also know the value of providing pets with protein rich foods. Unfortunately, doing so will mean they have to increase the price of their products, too. For the average pet owner, a very expensive kitten food is simply out of the question. As such, pet food companies try as much as possible to lower down the cost of production by adding carbohydrate sources – fruits and vegetables – into their formulations. All is not bad, however, since vegetables and fruits are rich in B-vitamins and other vitamins and minerals including Vitamins A, C, and E as well as magnesium, zinc, selenium, and phosphorus, among others. They’re rich in antioxidants and phytochemicals, too. Sadly, we have yet to see a pet food manufacturer that will disclose the actual percentage of carbohydrates into their formulation. Looking at the guaranteed analysis of products, you’ll see percentage values of proteins and fats in the minimum and fiber and moisture in the maximum. Unfortunately, there is no min-max for carbohydrates. Fiber can be considered a carb but this is the non-digestible type. We can only guess the amount of carbs in a product by calculating the minimum and maximum percentages of macromolecules. For instance, a product says it contains a minimum of 30% protein and 20% fat and a maximum of 10% moisture and 5% fiber. This already totals 65%. Does this mean the percentage of carbohydrates is about 35%? No one actually knows. As such, when looking for the best cat food for kittens, always go for the one with a higher protein content as this takes the percentage off carbs. What Type of Food Does My Kitten Need: Wet or Dry? There are two schools of thought when it comes to the type of food that is best for kittens. Let us try to understand these two before making any valid recommendations. Also known as canned pet food, kitten wet food contains more moisture than nutrients per weight of food. For example, a 3-ounce pack of kitten wet food can contain 78 percent moisture which essentially means 2.34 ounces of the preparation is water. The remaining 0.66 ounces is what comprise the nutrients – proteins, fats, and micronutrients. If the guaranteed analysis of the product says that it contains a minimum of 12% protein, then this is only equivalent to 0.36 ounces or roughly 10.2 grams. Given that a gram of protein is equivalent to 4 calories, then this is only equal to 2.55 kilocalories. This is one of the saddest facts about wet pet food. The nutrient content is so small that you will need more of it to provide the correct amounts of proteins, fats, and micronutrients to your feline friend. This doesn’t mean wet pet food is useless, though. Its major strength is in its high moisture content. This is very important in cats since they don’t have a thirst mechanism that allows them to recognize the sensation of thirst. That is why they need to be given moist food to help them stay hydrated. Kittens in particular need water because of the complex chemical processes occurring secondary to the building and development of tissues. Without water, these chemical processes may become faulty resulting in a host of problems. This is where a kitten wet food really helps. Furthermore, these types of cat food are considered a gourmet since they taste really fantastic. They make good diets for sick cats and kittens because the soft texture and amazing taste of the food can make even the sickest of cats to want to eat. These types of cat food are the exact opposite of a wet food. The good thing about a kitten dry food is that it is packed in nutrients. Let us look at our example above wherein we have a 3-ounce pack. This is just for comparison purposes, of course. Let us say the minimum protein and fat content is 40% and 20% respectively and the maximum fiber content is about 5%. This means we have more or less 65 percent nutrients. If the label says it has a maximum of 10% moisture, then that means we have 25% fillers, most likely carbs. Given that 40% of 3 ounces is 1.2 ounces or about 34 grams, then you are essentially looking at an 8.5 kilocalorie output. Let’s compare this side-by-side. The protein and calorie equivalent in wet food is 0.66 ounces and 2.55 kilocalories, respectively. In contrast, the protein and calorie equivalent in dry pet food is 1.2 ounces and 8.5 kilocalories, respectively. Of course, the downside to dry pet food is that it contains little moisture. In our example, it only contains a maximum of 10% or roughly 0.3 ounces. Now, this is not sufficient to keep your pet kitten hydrated. It will not be able to proceed with the various chemical processes needed for tissue building and maintenance. Based on our discussion above, it is clear that both wet and dry food have their strengths and weaknesses. Wet food is highly valued for its moisture content and exceptional palatability. Unfortunately, it contains too few nutrients that you will have to give your kitten more wet food to supply its need for nutrients. This makes it quite expensive. Dry food is revered for its high nutrient value and economy. It doesn’t spoil easily. Sadly, it contains very little moisture which may be detrimental to the various physiologic processes occurring in the kitten’s young body. If you choose to provide exclusive wet pet food, then you have to give more. If you choose to go dry, you will need to train your kitten how to drink from a bowl or a pet fountain. You can go for a combination of dry and wet food to harmonize the strengths of each and negate their respective weaknesses. 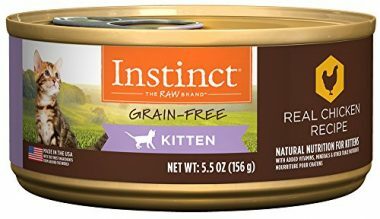 Can I Feed My Kitten Adult Cat Food? Given these differences, it is pretty obvious that you cannot feed your kitten with adult cat food, and you may use a feeder for this. Well, technically you can, but it doesn’t mean that you should. The calorie and nutrient requirements for both life stages are simply different. Since we’re talking about kitten nutrition, let us talk about various foods that you should never ever give to your kitten. We all have this tendency to share our food with our pets, as a means of strengthening our bond with them. Unfortunately, this can only spell more trouble. Here are some foods that you simply cannot give to your kitten. This delectable treat that almost every other person craves for can be fatal to many pets, cats and kittens included. This is because it contains both theobromine and caffeine which are natural stimulants that can lead to very fast heart beats leading to a failure in the pump mechanism of the hart. It can also cause muscle twitching and tremors as well as seizures. The danger is often proportional to the bitterness and color of the chocolate: the darker and more bitter it is the more likely is it to cause severe problems. As a stimulant, caffeinated products can produce heart palpitations, very fast breathing, and even muscle tremors. While these may not lead to the demise of your kitten, they can still be particularly dangerous. The main concern in these foods is that raw food may contain E. coli or Salmonella which can lead to a host of gastrointestinal problems. Fat trimmings, on the other hand, can lead to acute pancreatitis. It is okay to give milk and other dairy products to your kitten. However, if your kitten has lactose intolerance and you gave it dairy products, it may lead to vomiting and diarrhea and subsequently fluid and electrolyte imbalance. Did you know that a mere tablespoon of any type of alcohol is enough to cause brain damage and severe liver problems in young felines? Did you know that their liver and brain are still pretty much in their developing stages? Alcohol is processed by the liver and its byproducts are circulated throughout the body where they pose remarkable affinity to neurons in the brain. So, if you have to party all night, leave your kitten out of it. The risk of digestive upset is directly proportional to the amount of garlic and/or onions ingested by your kitten. There are also researches that show certain varieties of onions can actually lead to anemia, a condition whereby the blood’s capacity to carry oxygen is severely compromised. As you know, reduced oxygen to the tissues can lead to bigger problems. The evidence regarding the relationship between the ingestion of raisins and grapes and the occurrence of acute kidney failure is anecdotal at best. However, given the fact that there is no solid evidence to back up this claim, there is also no proof that it doesn’t. So, experts would rather be cautious than be sorry. Kittens are like babies. They are dependent on us to give them the best nutrition they need to build tissues and promote the maturation of their organs. That is why they will need high calorie and protein rich foods. 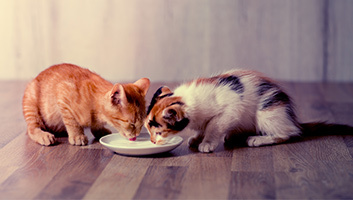 When it comes to choosing between dry and wet kitten food, it is important to look at their individual strengths and try to use these to address each other’s weaknesses. It is also important to resist the temptation of giving your young feline adult cat food as the calorie and nutrient composition of such foods are different from the needs of kittens. Equally important is learning the different human foods we should never give to our pet kittens, no matter how tempting. It is only through sensible nutrition that we can help ensure the optimum growth and development of our young beloved kittens.